1.00 - 4.00pm, guests are welcome to arrive between 1pm and 1.30 (for 1.30 start). Tickets: £12.50 each, includes afternoon tea of sandwiches, tea and cakes. 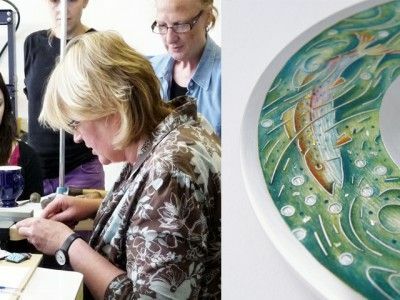 Location: The Athenaeum Club, Liverpool As part of Bluecoat Display Centre's ongoing programme of exciting artist's talks, the next event will feature local enamel artist Ruth Ball. Ruth will speak about her artistic career making, teaching and writing about enamelling. A traditional afternoon tea in the grand setting of The Athenaeum Club will follow the talk! This event is open to current and new subscribing Friends of Bluecoat Display Centre and The Athenaeum. As places are limited, to book a place for the event please call Bluecoat Display Centre on 0151 709 4014 or email crafts@bluecoatdisplaycentre.com.